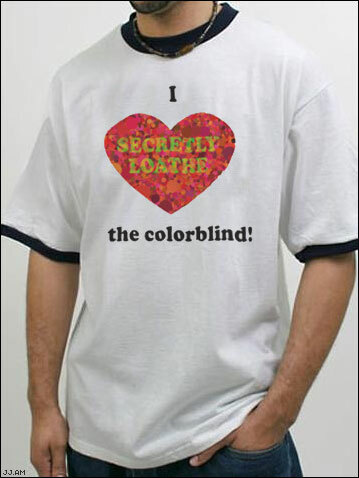 This lovely cotton t-shirt features black banded collar and cuffs and the words “I (heart) the colorblind”. Wearing these stylish threads is a half bearded, half-headed man wearing a tribal-surf wooden neckless with one hand in his pocket. Special Note: The Heart has a special message for those that are not colorblind. And that is why this shirt is funny. Oh so very, very funny. Making fun of disability… so classy.